President Donald Trump seen here touring a Boeing 767 airplane outfitted with chemtrail gear. 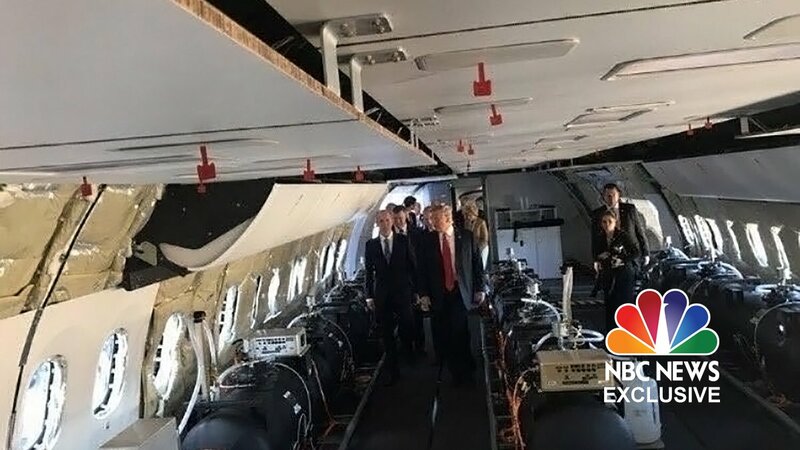 Washington D.C — Donald Trump, accompanied by select members of his cabinet, toured a chemtrail-outfitted dispersal airplane at Andrews Air Force Base yesterday afternoon, according to an NBC news report today. He then thrust his index finger into the air like it was a little bitty rocket. Anti-chemtrail activists across the country celebrated the decision. Some, including area anti-chemtrail activist Saihra Ramun, believe this is a reason to be hopeful. The President will not be able to redirect funding to other projects without involving Congress. He faces a basic rubber stamp of his plan in the House of Representatives, but a steep climb in the Senate, where many Senators favor large-scale geoengineering and population control efforts. “Turn our backs on the secret poisoning of our skies” not without holding someone accountable for the aftermath of. Chem/ConTrails/Chem Webs? You used a fact checker website like Snopes to debunk a story from a satirical website but didn’t bother to read the Snopes report. The Snopes report was lie stacked on top of lie and you bought it all while doing absolutely no investigation of your own. People like you are the problem. You think you are doing everyone a service but all you succeed in doing is propagating the lies of the establishment. Anyone stupid enough to believe Snopes deserves to live in the darkness created by their own mind. I hope you two will be very happy together. This is such BS. The original article came from a satirical website! Completely false!